Nathan Drake’s story began in a fishing boat off the coast of Panama. It would go on to define adventure itself. 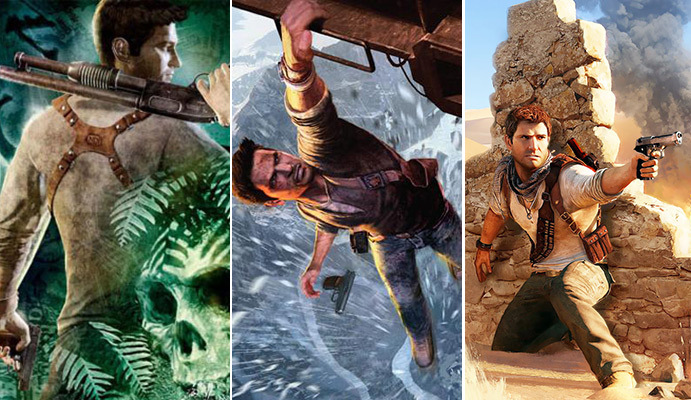 Uncharted: Drake’s Fortune, Uncharted 2: Among Thieves and Uncharted 3: Drake’s Deception – three of the most acclaimed games ever, together for the first time and rebuilt for PS4. This is Uncharted: The Nathan Drake Collection*. As Nathan Drake, you’ll follow in the footsteps of legends on a journey that spans the globe. Hunt for El Dorado, the fabled city of gold, using Sir Francis Drake’s own notes. Retrace Marco Polo’s doomed voyage through the Himalayas. And reveal the Atlantis of the Sands sought by Lawrence of Arabia. Along the way you’ll enjoy peerless storytelling from the team at Naughty Dog, as Drake puts life and friendship on the line in a race to discover unimaginable treasures before his ruthless enemies. *Uncharted: The Nathan Drake Collection includes single player campaign modes only.